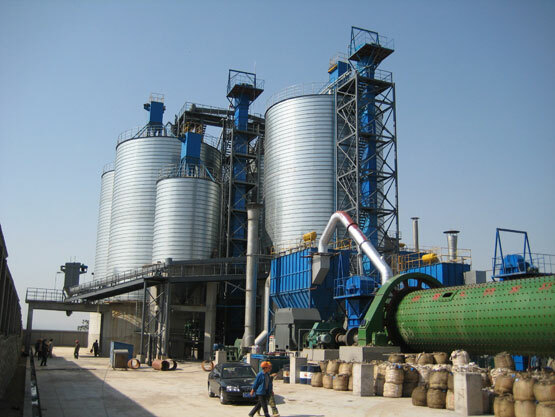 Cement silo, also called cement bin, cement container or cement storage silo, is widely used in cement production plants for storing cement. 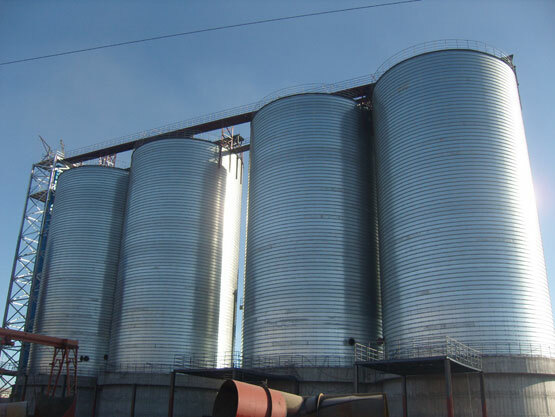 Flyer steel silos are spiral silos with abundant technical strength and prominent performance, they are built with unique manufacturing method, professional equipment, and mechanized operation. 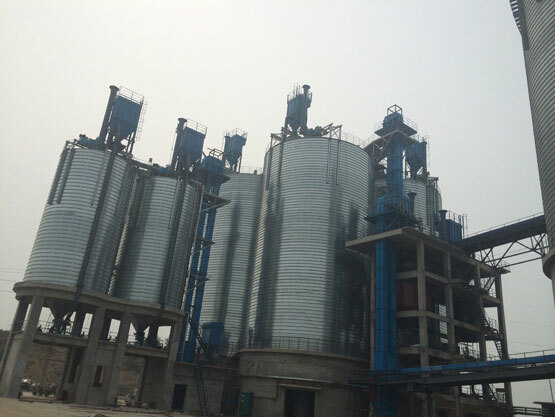 Flyer cement storage silo is famous for its solid structure and durability.Cement silos are on-site storage containers used for the storage and distribution of various types of cement mixtures. 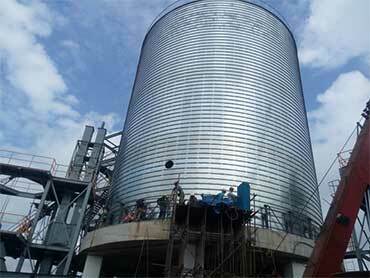 Spiral steel silos for storing cement is an indispensable part in cement production industry. 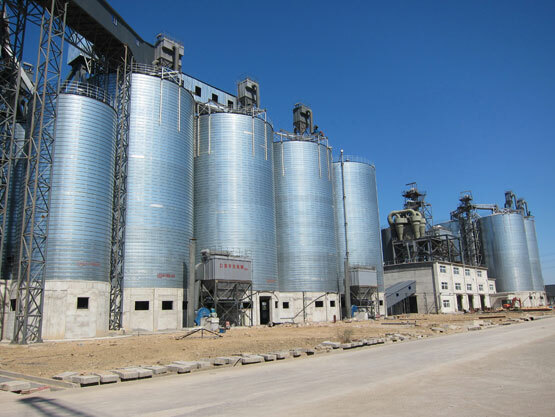 This type of cement silo has various capacities and sizes, making them the ideal storage solutions in many cement plants. Flyer Steel Silo is a professional manufacturer that produces high quality spiral cement silos and provides professional services from design, manufacture to install fitting according to the clients' requirements. 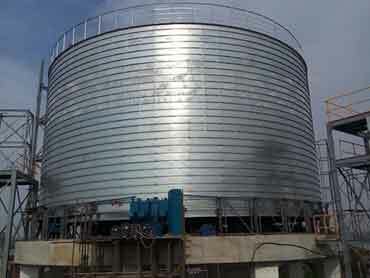 Cement silo is one of the most common kinds of spiral steel silo. 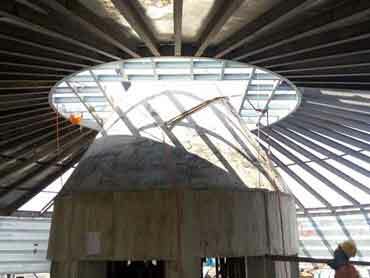 It is formed by 3 parts: silo roof(also called silo top), silo body and silo bottom. Silo roof includes cover board, purline, platform, upper ring, under ring, feeding hole, air hole, safety fence and Skirting board. Long service life: The thickness of spiral seaming edge is five times of the original steel plate, which greatly strengthens the resistance of the loading and extends the service life of silos. The galvanized steel plate with the corrosion resistant feature also ensures the silo’s long lifespan even under bad weather conditions. 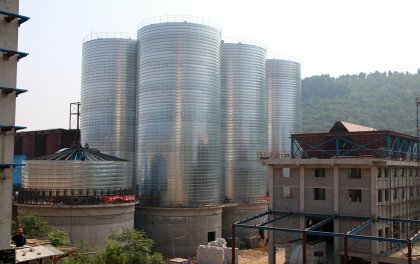 In addition, the cement silo’s durability may also reduce the maintenance cost. Short construction period: Our steel silo seaming machine can shape the silo 3-5m per minute. A cement silo with a capacity of 1000 tons could be constructed in 5-7 days. Low investment:Compared to concrete silo, spiral cement silo requires less people, and the construction equipment is more convenient to transport and install. Short installing period and less labor can save large cost. 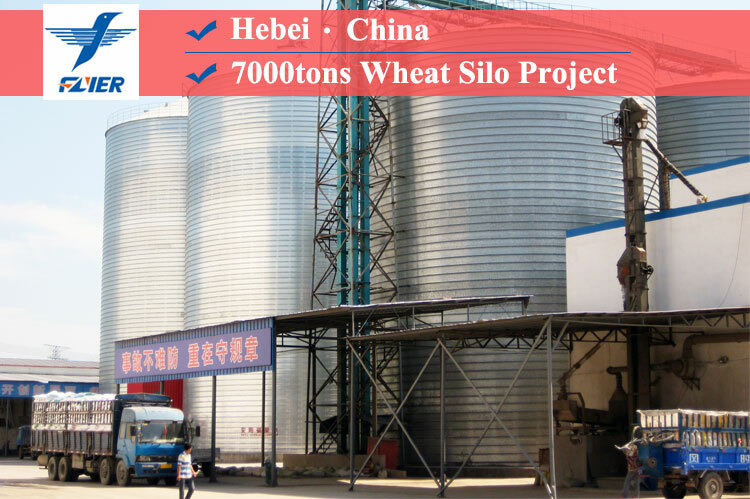 Moisture resistance:Our silos are constructed by special bending equipment, bended tightly. Cement inside the silos can't be influenced by the outside environment elements like wind or rain. And good air-tightness can prevent cement from absorbing moisture from the air. Galvanized cement steel silo: The surface of galvanized steel silo is smooth and the cement can’t adhere to inside wall of silo in block. Before constructing the cement silo, the bottle base of the silo must be erected by a dedicated crane and be placed on the prefabricated concrete foundation. Check out the perpendicularity of the erected silo and weld the base bottom of the silo with the embedded foundation firmly. 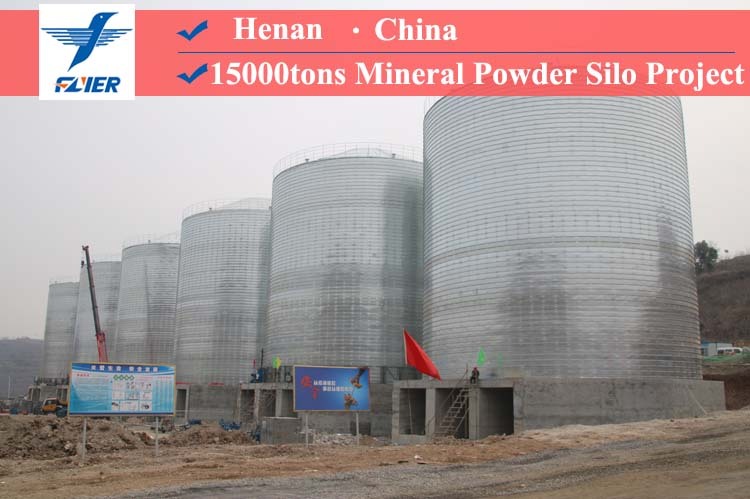 After the cement silo is constructed, cement can be transported into the cement silo by the pneumatic pressure of bulk cement truck if the transport pipe of cement truck connects with the feeding tube of cement silo. During the transporting process, the operator must press on the button of dust vibration motor to shake off the cement attached on the bag of dust catcher. Otherwise the cement may block inside the bag, silo explosion may occur. If cement blocks the bag, the pressure inside the silo will exceed the security pressure of the relief valve, and the relief valve will then open up immediately to release pressure inside the silo. Cement storage system is usually equipped with a material level measuring system, this system could show us the position of cement inside the silo. How to build a steel silo? Prepare the necessary equipment for building steel silo and civil work for silo concrete foundation. 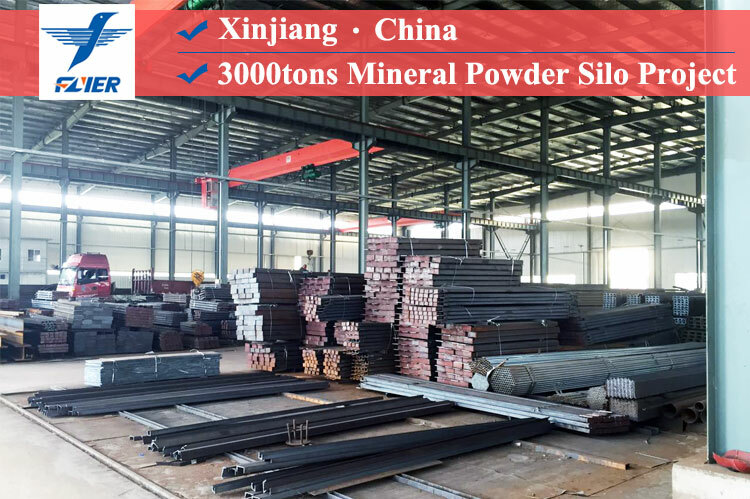 The silo foundation including concrete flat bottom and all steel structure flat bottom, final solution depends on the local site requirement and the silo capacity as well as silo size. Build the steel storage silo to the height of 2 meters or more, and then build the silo's roof. 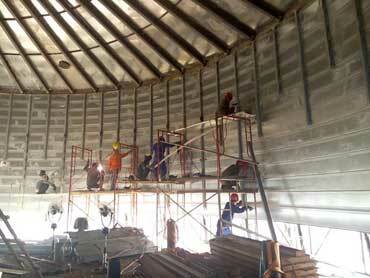 Install steel silo's roof: using cutting machine to make the silo roof horizontal and then install the silo roof. weld the purlins as designed in a circle, and connected to the upper ring. Build the steel silo up to the designed height, and then pull out the machine, drop the silo on the ground, make the silo body connects with pre-embedded parts in the ground. Welding silo roof cover plate and silo inside stiffeners. Here is a picture about the main processes of how to build a steel silo. 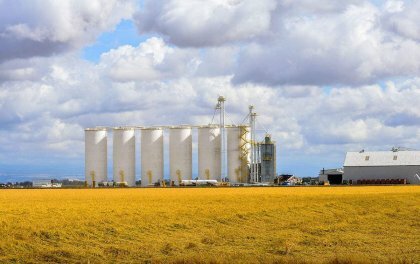 Why choose Flyer cement silo? Selecting superior materials: High intense hot rolled double galvanized coil are used to ensure steel silo's combination of stability, anticorrosion, air proof and good looking. Short construction period: Short duration can be guaranteed for the onsite construction during the whole procedure and for our professional equipment can provide a 3-5m per minutes' shaping speed, so a cement silo with a capacity of 1000 tons could be done within 5-7 days. Saving resources: Cost-effectiveness can be achieved for light sheets are used for the whole silo which made it just as heavy as the rebar of concrete silo. Comparably small coverage that could narrow the separation distance down to 500mm for maximized space utilization. 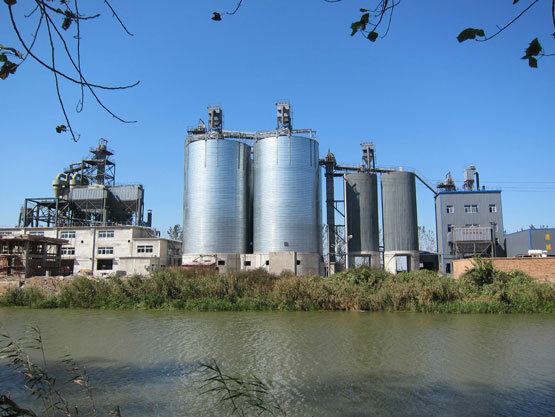 Wide range of cement silos' sizes: Flexible choices on dimensions are provided in a range of diameters from 3m to 28m, and a height of 35m in theory to meet various demands. Advanced technology and equipments: High automation, advanced loading and unloading equipments provide you great convenience on operation and management. 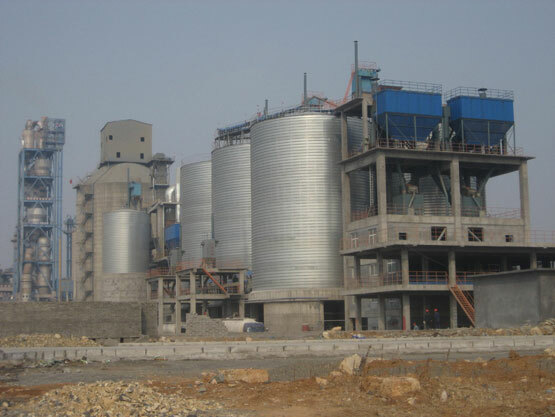 With abundant technical strength and prominent performance, Flyer Steel Silos are extensively applied in NSP cement production line as well as its corollary grinding station, and obtain a large market share. Good reputation: High reputation among customers has achieved as more than 4000 steel silos have founded in China cement industry, and several NSP cement production lines have been set up for some large cement group like Tianshan Group, Qilianshan Group, Tongda Group, Washi Group and etc. 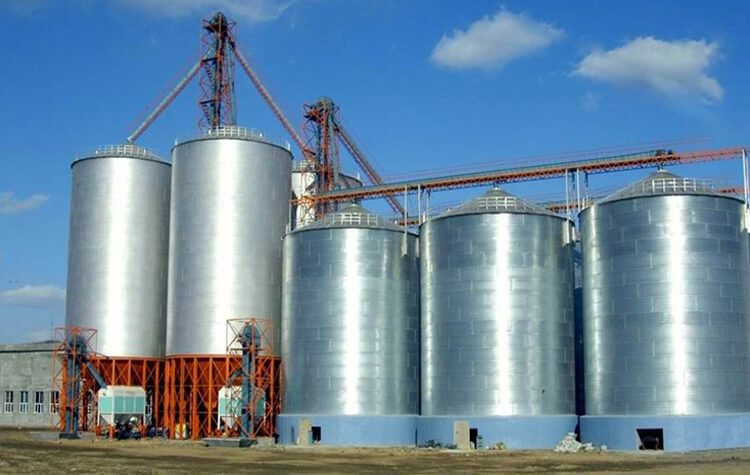 With advanced technology, unique manufacturing methods, professional equipment and mechanized operations, Flyer has successfully built many high quality steel silos. 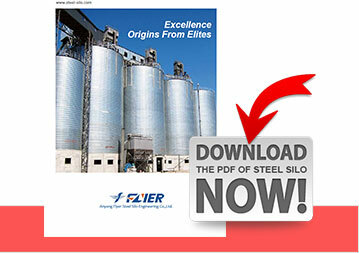 And Flyer will try its best to establish superior-quality steel silos to meet your own requirements, too! Feel free to contact us.